Though it continues to baffle me, there are companies hell-bent on using costumed characters as roadside advertising. At first, it was the actual costume store, but now it’s everything from the pizza place to tax preparation. You really can’t drive anywhere in this town without being greeted by a gorilla, Lady Liberty, or a big friendly clown holding a sign screaming about their daily specials. I don’t get it. Does this work? Do people see the guy holding the sign for “Dollar Daze” in one hand and “secretly” texting his girlfriend with the other hand and think, “hmm. I have a sudden urge to change my current plans, flip a U-turn, and stop by the dollar store instead!”? Do people drive by the gorilla pimping pizzas and stop in for a snack? I rely on social media for the efficient distribution of humor as much as anything else. And today, it failed me. Well, more specifically, the phone I use to consume much of said social media failed me. Today, I was stopped at the intersection of Joyce and College (at the longest red light in the history of the world) when I looked over to see the guy in the chicken suit advertising for the “Cash for Gold” place in a deep conversation with two Marine Corps recruiters. The chicken was being recruited! It might as well have said, “you’ve reached the end of the internet”. 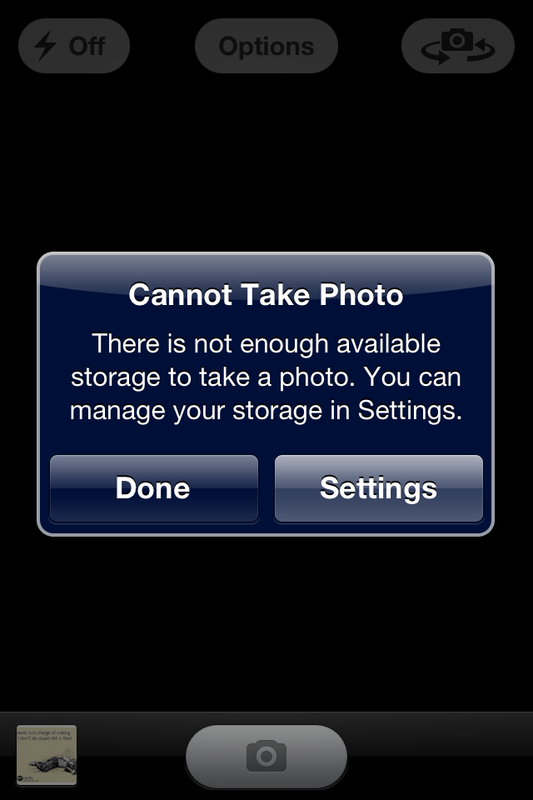 Oddly enough, it DID have enough available storage to capture this screenshot… Perfect timing, technology. No “available storage” for a chicken joining the marines during his “Cash for Gold” shift. So, you’ll just have to take my word for it. And how lame is that?